The Metropolitan Police says criminals are using crypto-currency cash machines to launder money in London. The government's aim is part of a broader update to the EU rules which are under negotiation. The update, revealed in Parliament last month, would mean that traders would no longer be able to operate anonymously. "I think these announcements have a powerful signalling effect and put the industry on notice that the 'cop on the beat' is concerned and watching crypto-currencies more closely now," he said of the Treasury news. "This in turn will motivate companies to more effectively self-police bad actors." "Organised criminal groups have been early adopters of crypto-currencies to evade traditional money laundering checks and statutory regulations," said Det Supt Nick Stevens, from the Serious and Organised Crime Command. "Criminals have also used crypto-currencies to purchase illegal commodities on dark market sites with anonymity." 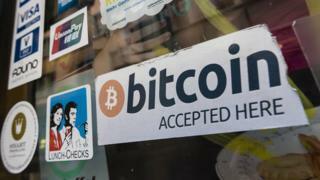 A Treasury spokesman said that there were already "clear tax rules" for legitimate crypto-currency users. "We also intend to update regulation to bring virtual currency exchange platforms into anti-money laundering and counter-terrorist financing regulation," he added. The value of Bitcoin has continued to climb after reaching a landmark value of $10,000 (£7,400) and at the time of writing was trading at more than $11,200. Bank of England deputy governor Sir Jon Cunliffe has advised people to "do their homework" before investing. "People need to be clear this is not an official currency. No central bank stands behind it, no government stands behind it," he told the BBC last week. US twins Cameron and Tyler Winklevoss are reported to have become the world's first Bitcoin billionaires, having invested $11m in the currency in 2013. That stake would now be worth $1.01bn, according to The Times. The brothers settled a legal dispute with Facebook in 2011 after claiming that Mark Zuckerberg stole their idea for a social network.